BOLT THROWER were formed in 1986 by Barry Thomson (guitar) and Gavin Ward (bass). They were soon joined by Alan West (vocals), and completed the line-up with the addition of Andy Whale (drums). Inspired at that time by bands such as Sacrilege, Discharge, Slayer and Candlemass, the four-piece went on to record two demos, ‘In Battle…’ and ‘Concession of Pain’. The latter was sent to the late, great John Peel, which resulted in the band being offered a session. At this time Gavin Ward decided to switch to guitar and then recruited Jo Bench on bass to complete the five-piece line-up. 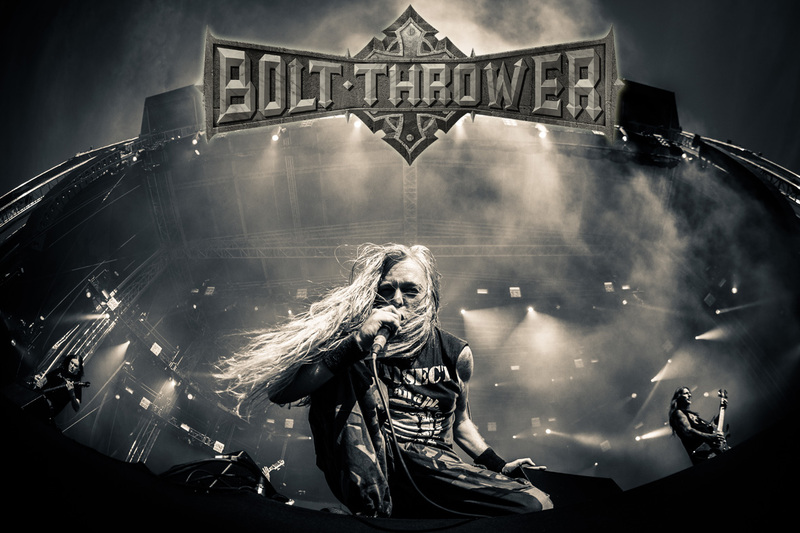 At the start of 1988, BOLT THROWER recorded their first Peel Session, and after the transmission was aired Vinyl Solution contacted the band and a deal was agreed. Unfortunately, Alan West decided that he no longer wanted to carry on with the band and was replaced by Karl Willetts. With this line-up they went on to record the album ‘In Battle There Is No Law’ recorded at Loco Studios in Wales and released in the summer of 1988. After constant gigging around the UK, the band were contacted by both Earache Records and wargaming company, Games Workshop. The result was ‘Realm of Chaos’, the band’s second studio album, which was released on Earache Records in 1989 and featured cover and booklet artwork from the artists at Games Workshop. The band were also honoured with the opportunity to record two more Peel Sessions (which were later released as an album). Bolt Thrower were starting to create a reputation of being one of the most powerful live acts around when they made their first tour of Europe in 1990. At the start of 1991 they recorded ‘Warmaster’ at Slaughterhouse Studios, Driffield with Colin Richardson producing and went on to do another successful tour of Europe and the U.S.
Next came ‘The IVth Crusade’ - recorded at Sawmills Studios in Cornwall in 1992, it showed the band had continued to create their own unique style of music that was easily identifiable as BOLT THROWER. The band promoted the album extensively with tours in Europe and Australia. The recording of ‘...For Victory’ in 1994 (at Sawmills, again) was immediately followed by the band’s second tour of the U.S. This unfortunately saw the departure of drummer Andy Whale and vocalist Karl Willetts, who decided they didn’t want to continue in the band. But the album was released later in the year and the band replaced them with drummer Martin Kearns and Martin Van Drunen on vocals. With this line-up the band carried on the promotion of the album with two European tours. The next couple of years turned into an endurance test for the band with Van Drunen leaving due to illness, the ending of the band’s relations with Earache Records, the subsequent signing to Metal Blade Records, and the eventual departure of Martin Kearns. Kearns was replaced by Alex Thomas for the recording of the first release on Metal Blade - ‘Mercenary’, (1998), and the vocalist on this album was to be the re-instated Karl Willetts. But Willetts found he was unable to commit to touring, so Dave Ingram (who had recently left Benediction), filled his postition. ‘Mercenary’ was greatly received all over the world - in particular Germany, where it made the band’s first entry in the German album charts. Another sold-out tour of Europe followed, and so did another departure, this time drummer Alex Thomas. Martin Kearns was re-recruited, just in time to do the ‘With Full Force’ festival for the second time, and joined again as a full time member. In January 2001, the band did a few dates in Holland and Germany, re-affirming their status as one of the best live acts around. Inspired by the response from the shows, the band went straight into the studio to record their 7th album, ‘Honour, Valour, Pride’. The album was once again highly received by both the press and the fans, and a European tour with Dave’s former bandmates Benediction followed in 2002. The band’s next major show was to be the Rock Hard anniversary festival, but unfortunately for the band and the fans, they had to cancel the show, due to the birth of Dave’s baby. A few months later, when the band were beginning to write material for their 8th album, Ingram decided he was unable to continue in the band, and the remaining members found themselves faced with the dilemma of who to replace him with. Ex-member Karl Willetts was the first port of call, and much to the joy of everyone involved, he instantly agreed to re-joining as a full time member of the band again. Karl warmed-up his voice straight away, by re-recording his vocals on a demo version of ‘HVP’, the results showing that his vocal ability was still there in force. With the line-up complete once again, the next few months were spent writing and re-writing the new material until the band were 100% satisfied with the completed songs. The band spent the summer of 2005 recording the new material, and the results were revealed when the band unleashed their 8th studio album, the glorious ‘Those Once Loyal’. It went on to be ‘Album of the month’ in most of the metal magazines worldwide, and was their highest acclaimed album to date. In 2006 the band did their most extensive touring so far, playing two separate ‘Those Still Loyal’ tours including territories never played before, like Spain, Italy, Finland, etc. The majority of the shows were sold out and the band’s ever growing popularity was clear to see. In 2007 the band played a handful of shows and went on to spend the majority of the year writing songs for a new album. This proved to be more difficult than they thought, as in 2008 Bolt Thrower released a statement saying they had scrapped plans to record the new material they had written, thinking the songs they were working on didn’t match up to ‘Those Once Loyal’. They decided that they would rather not release any new stuff than what they saw as taking a step back. The decision was a very brave one, but gained Bolt Thrower a lot of respect, and fans are still holding out in the hope that the band will someday write songs they feel good enough to record.. Although no new album followed TOL, the band continued to play live, much to the delight of their die-hard following. 2008 gave BT a lot of special memories, including making a triumphant return to the US for the first time since 1994, to play the Maryland Deathfest. They played both days of the festival, indoors and out, to a packed and euphoric audience, and fans in the US finally got to see Bolt Thrower doing what they do best. Despite their previous dislike for playing such shows, the band couldn’t deny that the festival environment goes hand in hand with their style of music, and decided to hand pick a few festivals to play over the coming years. 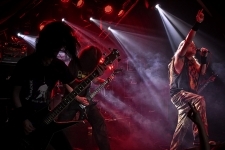 And in addition to the odd European festival, Bolt Thrower also returned to Birmingham to play their first hometown gig for 15 years, played two consecutive shows at the brand new Atak venue in Holland, and flew to Greece for the very first time in the band’s history, to play two sell out shows there. Over the last couple of years, Bolt Thrower have continued their ‘quality not quantity’ approach to playing live and that has definitely paid off. In 2010 they played a number of shows and festivals across Europe, and from playing more intimate underground shows (in keeping with their roots), they can also pull off playing to a festival crowd of 30,000 people. That’s why, as they reach their 25th Anniversary, Bolt Thrower are still at the top of their game.